At first glance, a film about the 1967 riots in Detroit may seem to be an unlikely choice for director Kathryn Bigelow. Instigated by a police raid on a private party celebrating the return of two black soldiers from Vietnam, the riot lasted from July 23 to July 27, leaving hundreds injured and more than twenty dead. Most of the film takes place in the Algiers Motel, in a highly debated chapter of history where three teenagers were killed by Detroit police officers over the night of July 25-26. But Bigelow made an oddly similar film in 1995 with her sci-fi conspiracy thriller Strange Days, set against the backdrop of racially fuelled chaos in Los Angeles. In both films, Bigelow creates a metaphor for how racism works in contemporary society. Both films comment on how white men with a badge seem to have the authority and institutional agency to exact a revolting degree of brutality on people of color, while also protecting themselves with an established system of corruption and prejudice. And while some have claimed a white woman could not capture this story, it’s that sort of disregard for the capacity of an artist to research their subject, empathize, and tell a story that always proves shocking, and it’s a disappointing assessment of one human being’s ability and willingness to understand another person, regardless of race or gender. Filmed in a faux-vérité style for the most part, Detroit opens with a painterly animated sequence detailing the Great Migration in 1916, followed by the segregation and oppression of black citizens within the city limits of Detroit (and many other U.S. cities) by aggressive white policemen. The resulting institutionalized racism subjugates and disenfranchises; but according to the intertitles, change will inevitably come, “the question was when and how.” For those familiar with the events recounted in the film, justice does not have its day, leaving the prologue’s titles curiously vacant and over-promising given the turbulent and contested outcome. 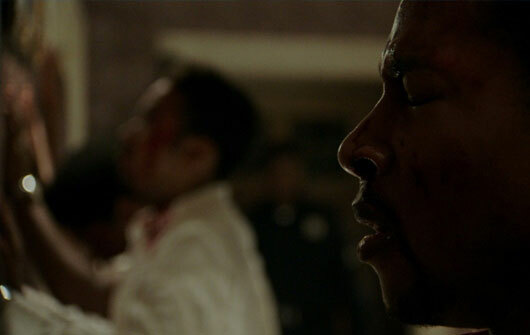 Elsewhere, the screenplay, written by former journalist Mark Boal, who collaborated with Bigelow on The Hurt Locker (2009) and Zero Dark Thirty (2012), uses the riot as a framing device for the Algiers Motel incident. Much of the film involves the characters who find themselves either in the riot, trying to remain outside of it, or trying to control it. The centerpiece is the nauseatingly difficult to watch sequence in the Algiers, which seems to epitomize everything Bigelow and Boal want to comment on concerning race. 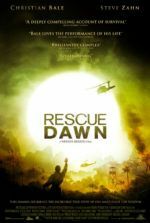 Interspersed with clips of documentary footage from the actual events, the film proceeds using a formal style of handheld cameras and outlying perspectives, giving the audience a sense of being there, looking on from a distance. A similar blend of actual and dramatized images was used on this year’s Patriots Day, but the outcome proves more integrated thanks to cinematographer Barry Ackroyd—a longtime collaborator with Bigelow and vérité-driven directors like Paul Greengrass. Early on, the viewer feels thrown into escalating tension between racist white cops trying to restore order, as crowds throw Molotov cocktails and indiscriminately loot local businesses. Congressman John Conyers (Laz Alonso) shouts into a megaphone that “Change is coming!” But the crowd wants immediate action. 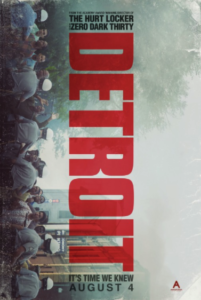 The story comes into focus around several young people who find themselves at the Algiers, where Carl Cooper (Jason Mitchell) fires a harmless starter pistol out of a window toward the National Guard, inciting an aggressive response from the Guardsmen and Detroit police, who come looking for a potential sniper. By this time, we have already seen an edgy militarized police force shooting at windows in fear of sniper fire when a small child takes a look outside. We have also seen three lawless officers, led by the sociopathic racist Krauss (Will Poulter), shoot an unarmed black citizen in the back and attempt to cover it up. Krauss, along with his cruel cohorts Demens (Jack Raynor) and Flynn (Ben O’Toole), seem to use the riots to enact their own sickening brand of racial cleansing. It comes as no surprise that when the overreactive authorities arrive at the Algiers, they open fire on the motel’s annex, and Krauss shoots Cooper on site. Krauss’ trio lines up the motel’s inhabitants to play a nearly unwatchable “death game,” where the officers take the detainees into a separate room one at a time, and then pretend to shoot them in order to elicit a confession from the others. Except, there’s nothing to confess. Among the group are would-be Mowtown musician Larry Reed (Algee Smith) and his friend Fred Temple (Jacob Latimore), as well as Robert Greene (Greene), a newly home Vietnam vet, who the officers find with two white girls from Ohio (Hannah Murray and Kaitlyn Dever). Although several characters have been changed or made into composites (Krauss, for example), the sensation of visceral, unflinching reality remains through most of Detroit. The extended, nearly-hour-long sequence inside the Algiers leaves the viewer exhausted from a constant state of tension, disgust, sadness, fear, and anger from the injustice of it all. When a National Guardsman (Austin Hébert) looks on, he seems to know what he’s seeing is wrong, but he does nothing, and we feel incensed. It’s more understandable with Dismukes (John Boyega), a black security guard who quietly observes, walking a narrow line between protecting those in harm’s way and remaining on the officers’ good sides. As the top-billed central character, Dismukes is accused by his fellow Detroitians of being an Uncle Tom, but he’s also a survivor. Still, while the audience of Detroit can barely remain in the theater to watch the terrifying scene at the Algiers, we yearn for Dismukes to act and stop the horrifying events before us. Of course, he cannot. The involving, excruciating scene at the Algiers gives way to a paranoid aftermath, where the Detroit police to try to make Dismukes a scapegoat, and the officers involved face a trial. Despite their confessions, the officers’ slick attorney (John Krasinski, distracting) gets them off on a technicality, leaving the viewer nothing short of enraged—a feeling that never subsides. Only a final coda in which Reed sets aside his ambitions for Mowtown and finds solace in a church choir does the film offer some consolation, but it feels artificially added to the material, weakening the otherwise prevailing critique, outrage, and grief. Almost everything that occurs after the Algiers sequence seems to come from another film altogether; it looks and feels like standard courtroom drama, as opposed to the frenzied first act and the horrifying torture chamber of the second. The film’s momentum is lost after such sharp emotions through its middle section, and the attempt to move the final scenes away from our consternation underestimate how upsetting the earlier scenes remain. Detroit contains no broad harmonies or appeasements, beyond the answers that Reed finds for himself in church, which hardly offer any tangible or sweeping progress against the ever-present condition of police brutality and racism present in our culture. In the opening’s animated titles, the film suggests that change must and will come. Fifty years later, given the police violence perpetrated in recent years, the socially and politically codified racism by the alt-right and white nationalists in our culture today, and the urgency of this conversation in our present society, it hardly seems possible. And while Bigelow’s craft places the audience at the scene, slicing an open wound to fester and rot with only a mournful hope that things will improve, her film’s meandering attempts to find some silver lining, later on, prove ineffective. 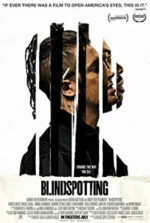 Regardless of its inconsistent structure, the film overall underscores a terminal condition of unresolved, normalized racism in America that, if treated with complacency, furthers exploitation from those in power. Detroit suggests that the self-destructive riots only resulted in further despair, but to not act in the face of such widespread racism would be almost inhuman. Indeed, there are no easy or cohesive answers or solutions in the film, nor in the real world.